Bill (Charlie Creed-Miles) is released from prison after serving an eight-year sentence. When he arrives home, he finds that his sons’ mother has disappeared, leaving them to fend for themselves. Bill must put his plan to move to Scotland on hold and figure out what matters to him. Wild Bill is the directorial debut from actor Dexter Fletcher, and while it follows the usual story of a London gangster and draws inspiration from the movie of Guy Ritchie – with a dash of Shameless’s council estates – the story takes a slight twist; the demons that Bill must face are not those of his criminal past, but he must come to terms with being a family man for the first time in his life. The cast are extremely well directed and Fletcher is confident in his new role behind the camera. Charlie Creed-Miles is quiet but great in the title role, it is in the quiet moments that he really comes into his own – especially a lovely scene where he teaches his youngest son how to fly a paper aeroplane – but the climactic fight is real and gritty enough to work. Will Poulter steals most of the scenes he is in, however, as Bill’s young son Dean. Poulter carries the anger and confusion for the entire family unit and when he begins to accept his father the films becomes warm and soft around it’s brittle edges. Andy Serkis continues his stellar work of late as the menacing crime lord Glen. Wild Bill is a careful mix of crime and family, and Bill’s change of heart towards his sons is gentle and reassuring. However, while the two sides of Bill’s past and present are carefully blended together, the movie will feel familiar to many. This is a world we have seen on screen before, and if the audience is familiar with the slightly crazy world of Shameless then the movie will definitely feel as though it is taking a well-trodden path. This is not quite enough to detract from the movie as a whole, but Wild Bill is not as fresh as it could be. In all, Wild Bill is a skilful debut from a well-known character actor, which contains some sweet moments from a well directed cast, but the films and directors that have obviously influenced Fletcher have already explored this world. 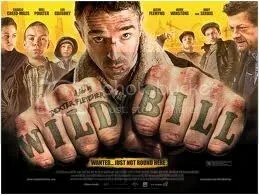 Wild Bill is a good film, but it’s familiar subject matter stops it from being great.